Coronation portrait of Catherine the Great. Source: courtesy of the State Hermitage Museum. A new book about Catherine the Great offers insight into the life and loves of an extraordinary woman. Two hundred and fifty years ago, Catherine the Great became empress of Russia. During her 34-year reign, she extended Russia’s boundaries, presided over an age of cultural enlightenment and founded the collection, which became the Hermitage Museum. Why are Tolstoy's novels popular in the West? Her varied adult intimacies are likewise shown as a natural part of life, openly acknowledged and often kept separate from politics. From her physical passion for the young, handsome Gregory Orlov to her lasting partnership with Gregory Potemkin, Catherine’s romantic history is sympathetically portrayed. 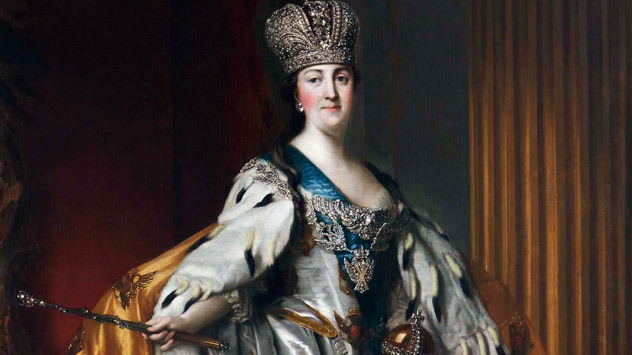 Her letter to Potemkin in February 1774 detailing her previous lovers is “unique in the annals of written royal confessions,” not least for what it tells us about the empress as a person. “The trouble is that my heart is loath to be without love even for a single hour…” she writes. Catherine’s dedication to Russia and its people is clear. The image of the princess catching pneumonia as she paced the stone floors of a Moscow palace in winter, while learning Russian by candlelight, was a powerful force in the early Catherinian myth. Her mastery of the language and conversion to orthodoxy, exchanging her original name, Sophia, for her new identity as Catherine, were signs of commitment. At the same time, like Peter the Great to whom Massie often compares her, she introduced European ideas into Russia in the fields of “moral, political and judicial philosophy, literature, art, architecture, sculpture, medicine and education.” She built hospitals, schools and orphanages and had herself inoculated against smallpox as an example to her people.